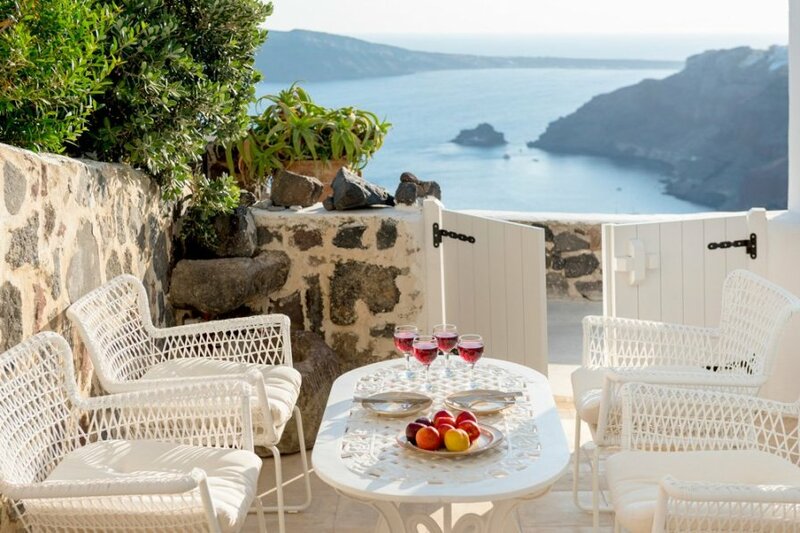 Villa Aspro Spiti has a fantastic position on the highest point of Oia Village in the Perivolas area offering guests spectacular views across the cliff, village and volcano, these views are even more beautiful at sunset! The location is excellent, just 500m from the centre of Oia village and its wide range of amenities, including shops and restaurants. Being set out over three floors, the villa would suit couples holidaying together, a small group of friends or a large family. The villa has been beautifully and thoughtfully furnished in a style that combines traditional architecture with minimal and contemporary design. The villa comfortably sleeps six guests, however it is possible to accommodate a further two guests in sofa beds. On the lower level of the main cave is a queen-size double bedroom with en-suite bathroom and a living and kitchenette area. Upstairs, on the upper level, is a magnificent king-size double bedroom which boasts a luxury marble en-suite bathroom with jacuzzi bath tub. Also, on this level is the living and dining areas with access to the terrace as well as a kitchen fully equipped with all necessary modern appliances. There is a “loft apartment” which is accessed via internal stairs, here at the very top of the house is the third double bedroom which offers guests unforgettable views. Also on this level is another living and kitchen area and access to a balcony with outdoor seating. Outside, guests can soak up the tranquil surroundings from the infinity jacuzzi plunge pool on the terrace or enjoy a glass of wine on the upper balcony while admiring the sunset views.